A frenetic draw (5-5) didn’t stop the party at the Palau. At the start Voltregà provided a guard of honour for the culés, who had won the OK League the previous Matchday against Lleida, and the Europa League against Porto. Right from the first whistle, the intensity from both sides was obvious, with Barça looking to remain unbeaten at the Palau and defending a record of 13 wins and two draws in the OK League. Goalkeeper Egurrola was inspired as the visitors pressured the home defence at every opportunity, the hosts controlling the match until Voltregà got themselves back in the game with two goals in two minutes (2- 2 min 25). Neither side could make their advantage count for any significant length of time. 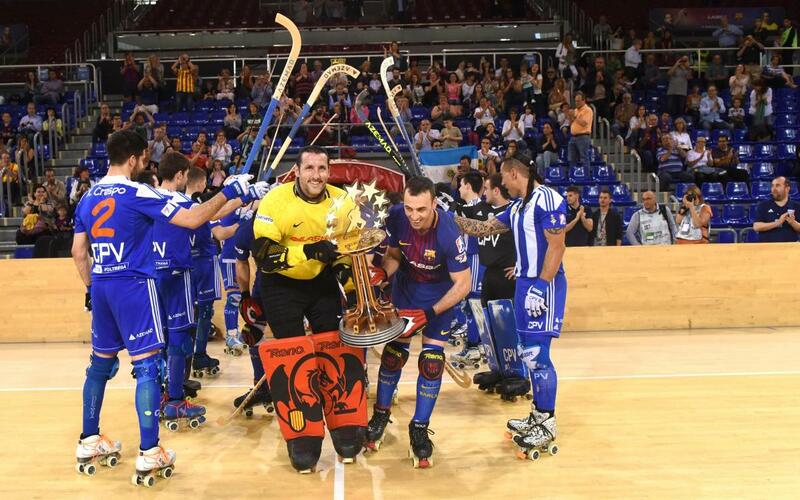 Barça Lassa went ahead twice more towards the end of the game and Voltregà also led for two minutes. Despite the draw, nobody was left disappointed as the league trophy was raised at the end of proceedings.